Jeremy Allen Bonderman (born October 28, 1982) is an American former professional baseball pitcher. Bonderman batted and threw right-handed. Bonderman attended Pasco High School in Pasco, Washington. In his last year of high school baseball, he went 5–2 and recorded a 3.60 earned run average (ERA). He is the only high school junior ever to be drafted with a first round pick in baseball history. Bonderman was drafted by the Oakland Athletics out of high school with the 26th pick in the 2001 Major League Baseball Draft, a selection that, according to Michael Lewis's Moneyball, caused Athletics general manager Billy Beane to throw a chair through a wall in fury. On July 6, 2002, Bonderman was involved in a three team deal. The Athletics had sent Carlos Peña, a player to be named later (who later became Bonderman), and Franklyn Germán to the Detroit Tigers. The New York Yankees sent Ted Lilly, John-Ford Griffin, and Jason Arnold to the Athletics. The Tigers sent Jeff Weaver to the Yankees and cash to the Athletics. Bonderman debuted in the major leagues when he was 20 years old. His major league debut came against the Minnesota Twins, who scored six runs in four innings. In his first season, he had a 6–19 record. The next season, Bonderman went 11–13 with a 4.89 ERA. In 2005, he had a 14–13 record and a 4.57 ERA. Bonderman was the Tigers Opening Day starter for the 2005 season. In 2006 Bonderman finished with a 14–8 record, his career best and posted a 4.08 ERA. He started game four of the 2006 American League Division Series against the Yankees. He pitched five perfect innings before giving up a hit. He then pitched 3 1⁄3 more innings, surrendering only one run. Bonderman was the winning pitcher in the game that gave the Tigers the series. He pitched again in game four of the 2006 American League Championship Series, pitching six innings and giving up three runs. The Tigers would go on to win the game and series for the American League Pennant. In the World Series, he pitched six innings giving up two runs. He left the game with the Tigers in the lead. However, the Tigers would ultimately lose the game, as well as the series the following day. In 2007, Bonderman had the best start of his career, but after the all-star break he struggled only winning four games, finishing 11–9 with a 5.01 ERA. He finished second in the 2007 All-Star Game Final vote. Bonderman missed most of the 2008 season because he had procedures done to remove a blood clot in his axillary vein. On June 13, 2009, five days after his only start of the season, Bonderman was placed on the disabled list indefinitely because of recurring pain in his pitching shoulder. Bonderman started 29 games for the Tigers in 2010, going 8–10 with a 5.53 ERA. Following the season, he was granted free agency. The Plain Dealer reported that the Indians had interest in Bonderman, but for only a minor league contract. Bonderman remained unsigned through the 2011 season. On December 21, 2012, Bonderman signed a minor league contract with the Seattle Mariners. The deal included an invitation to spring training. He made his first start for the major league club on June 2, and took the loss in a 10–0 win by the Twins. On June 7, in his second start, he pitched three-hit ball for six innings to beat the New York Yankees and earn his first win since 2010. He was designated for assignment on July 8, 2013, following consecutive poor starts. On July 14, 2013, Bonderman was signed to a minor league deal bringing him back to Detroit, playing for the Triple-A Toledo Mud Hens. On August 5, 2013, Bonderman was recalled from the Mud Hens, to join the Tigers bullpen. 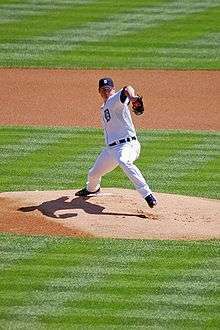 In his first appearance back with Detroit, Bonderman pitched three innings of scoreless relief in the Tigers 6–5 victory over the Cleveland Indians, to earn his first career victory in relief. Bonderman threw four pitches, relying primarily on a two-seam fastball at 89–93 mph. His other pitches included a slider at 80–82 mph, a four-seam fastball at 89–92 mph, a changeup at 85–88 mph, and rarely a cutter at 86 mph. Bonderman resides in Pasco, Washington with wife Amber and two children, Mailee Blaize (born June 1, 2006) and Tripp Allen (born December 28, 2009). ↑ "Baseball Mogul Encyclopedia: Jeremy Bonderman". ↑ Lewis, Michael (2003). Moneyball: The Art of Winning an Unfair Game. New York: W. W. Norton. pp. 16–17. ↑ Beck, Jason (July 5, 2007). "Bonderman second in Final Vote". MLB.com. Retrieved June 25, 2014. ↑ Johnson, Scott (June 7, 2013). "Mariners 4, Yankees 1". Yahoo! Sports. Retrieved June 8, 2013. ↑ "Bonderman's comeback with Mariners finished". Sportsnet.ca. July 8, 2013. Retrieved July 8, 2013. ↑ Iott, Chris. "Jeremy Bonderman signs minor-league contract". M-Live. Retrieved July 14, 2013. ↑ Beck, Jason (August 4, 2013). "Tigers call up Bonderman to join bullpen". MLB.com. Retrieved June 25, 2014. ↑ "PITCHf/x Player Card: Jeremy Bonderman". Brooks Baseball. Retrieved August 26, 2013.